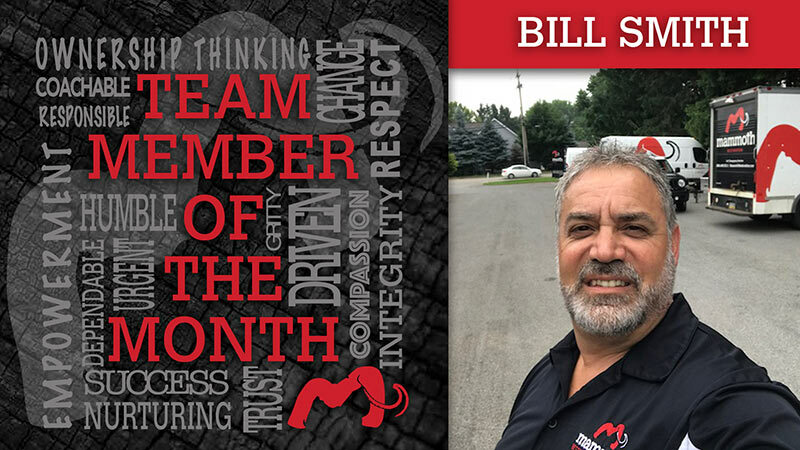 Mammoth Restoration would like to congratulate Bill Smith, our Business Development Rep (BDR) from our Edinboro, Pennsylvania Office for being awarded our Team Member of the Month for October. Bill’s drive and representation of Mammoth’s core values were on display as he made an incredible sacrifice in order to help those affected by Hurricane Florence in North Carolina. Bill left his family and endured complete devastation for a few weeks networking with the local community, government officials and local school districts. His actions and communication helped shape our plan of attack for future disaster situations. 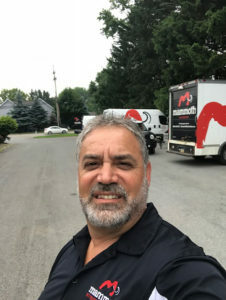 His overwhelming drive, positive outlook in a bleak situation, and teamwork oriented perspective made him a shoo-in to fill our opening for the Key Accounts Manager (KAM) as Mammoth Restoration invests more into our Large Loss division. Thank You, Bill, for all that you’ve done and continue to do in helping our team grow. Join us in learning a little more about our October Team Member of the Month and new Key Accounts Manager for 2019 in our quick survey below. What is your favorite part about working at Mammoth Restoration? What made you want to jump in and help out with Hurricane Florence? I wanted to jump at the opportunity to help with hurricane Florence for the experience, and I feel you need to truly be on ground zero through these to understand how to help. Can you describe what you saw in North Carolina during your Hurricane Florence efforts? People we didn’t even know we’re offering us lodging to stay with them and their families. Outside of work I truly like to just be with my family and friends. As Team Member of the Month, you receive a $250.00 bonus. What are you going to spend it on? What fellow team member/s do you look up to and why? And Mammoth family. As everyone brings something unique to the team. Makes for a good soup. Where do you view Mammoth Restoration as a company in the next 5 years? Where do I see Mammoth in five years? I see is doubling if not tripling in size in revenue as we continue to do things right lead the charge in new markets! One thing you don’t know about me? I was born in only child and now have nine brothers and sisters. Name two things on Bill Smith’s bucket list? Two things on my bucket list I would like to learn how to play guitar. Ride Harleys across the country with my sons. Why should others want to work for Mammoth Restoration? Interested in working with Mammoth Restoration? We’re always looking for A-Players to add to our team. Click Here to view our current open positions and learn more about the Mammoth Team.